Keeping track of how many hours per week you have your contact lenses out of your eyes is a great first step toward reducing your risk of contact lens overuse. 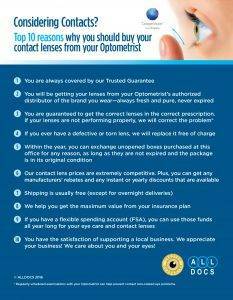 If you come in under 18 hours per week with your contacts out, you should be wearing your contact lenses less. Your eyes require oxygen, and having your contacts out any less than 18 hours per week denies your eyes the requisite amount of time they need to “breathe in” this valuable necessity. This may cause a process, called neovascularization, in which new blood vessels grow in your eye in an attempt to supply missing oxygen to parts of the eye that are starved of it. These blood vessels do not belong in that part of the eye, they will normally block your vision, doing potentially serious harm to your eye, and will not even succeed in bringing enough oxygen to your eye anyway. One way to make sure that you hit the magic 18 hour mark is not to wear your contacts every day. Choosing your glasses over your contacts every so often will allow your eyes to recover from the strain inherent in contact lens wear. Once or twice a week is all that is needed to be sure that you are giving your eyes enough time to rest. Also, remember that while you have your contacts in, it is NOT nap time! Unless your doctor specifically tells you that your contacts are extended wear, and safe to wear while sleeping, leaving your contacts in overnight, or even for a brief nap during the day, can do serious damage to your eyes. Finally, perhaps the most important and also most neglected point of all: Be strict about replacing your contacts based on their recommended wear time. If your doctor says to change your contacts every month, write it on your calendar. If they're daily wear lenses, DO NOT wear them for a second day. Many people are not cautious about this because they believe that as long as the contacts are comfortable, there is nothing wrong with the lenses. By the time the contacts are uncomfortable, however, it is quite possible that damage may have already been done. For any questions and further tips, feel free to contact Dr. Brewer today.